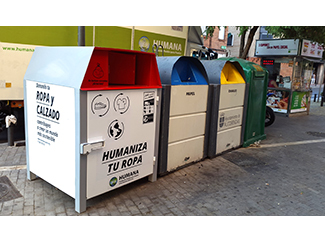 Gradually the Foundation is implementing the new model of container for the collection of used clothing in municipalities and partner companies. It is a major breakthrough in security and usability for donors compared to previous models. The new containers also incorporate adhesives with a new design and a clear call to action: 'Donating your used clothing and shoes are contributing to a more sustainable world' and a message: 'Humanizes your clothes'. The result is a container that gains in visibility for donors. One of the partners municipalities that already implemented the new container is Alcobendas. It also is a special case, since the container does not look the usual green color but white and red suggested by the council, to suit the image of the rest of containers included in waste collection. 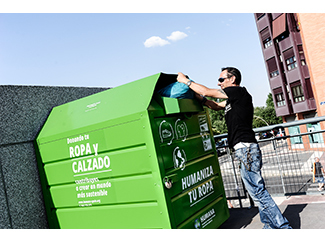 From January to June this year, the 51 Humana containers in Alcobendas collected 149,740 kg of used clothing and footwear, facing to the 136,531 kg of the same period last year.